Below you will find information on the materials we use to create our beautiful jewellery. The main materials we use are seeds which are found in just a few Latin American countries. MATERIALS: Women for Conservation always endeavour to look after the natural resources under our protection by using materials that are harvested sustainably. Many of the seeds can be gathered from the forest floor or bushes and for the amount of seeds needed it is necessary to get a skilled local to climb up into the palm trees. Harvesting and commercializing the seeds encourages forest growth and provides a positive way of generating income without resorting to harmful practices such as illegal hunting of endangered wildlife, logging or forests being turned into cattle pastures. 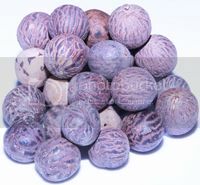 The seeds are dried and processed using traditional techniques to turn them into unique beads; they are then dyed using either vegetable or non toxic and lead-free dyes. There are never two beads the same due to the natural patterns. The main material used in our collections is Tagua, which is the hardened fruit of the Ivory-nut Palm Tree (Phytelephas Macrocarpa). It flourishes in the tropical forests from Paraguay to Panama; Tagua is a sustainable substitute for elephant and whale ivory because of its properties and similarities. Tagua is a wild fruit, which grows in tropical forests under loads of other trees which provide it with shade. It is almost impossible to reproduce the conditions and type of soil in which is able to grow. There are male and female trees and only the female bears the fruit. 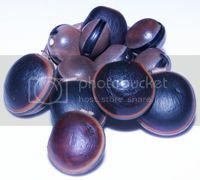 Tagua reproduces itself when the fruit falls on the ground, many start to take root and become fully grown palms. The fruit required for craft making can only be collected when it falls on the ground, if collected before, it will not harden and it cannot be used for crafts. Only a small percentage of the Tagua is collected to encourage forest growth. Wildlife feeds from the outer layers of the fruit leaving the fruit behind and making it easy to collect. The Azai comes from the Euterpe Precatoria palm tree. It grows at sea level and up to 2.000 m above sea level. It is distributed throughout Central America, Antillas, the North of South America, the Amazon basin and part of Guyana. It grows up to 20m of height; they are frequented by Toucans because of their fruit. Various parts of the Azai palm tree are used in many ways: The leaves are used for roofing, the fruits and roots for their health and energizing properties and the seeds for crafts. The Bombona seed comes from a majestic palm tree Dictyocaryum lamarckianum also known as ‘Palmera Barrigona‘ (Big Belly Palm Tree) Found in wet forests of South America at between 800 to 1.200m above sea level. It grows up to 30m and it requires rich soils, plenty of water and frost free conditions. In the areas of natural distribution it is used by the Embera indigenous for constructions and its fruit is eaten or used to make wine or jams. The seeds are used for craft making. Ormosia colombiana Rudd According to the Botanical Gardens of the Technological University of Pereira (Colombia), this specie is used as shade for the production of charcoal and firewood. 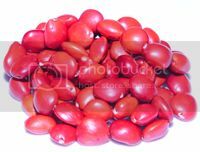 Its seeds are naturally red/orange and can also have black spots, making them very attractive for making handicrafts, especially jewellery. Many locals don’t realise that keeping these plants can bring revenue by selling the desired seeds for jewellery making, therefore it is often cut down to make way for more ‘useful’ plants. 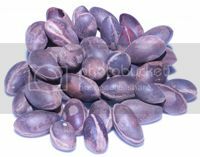 Ojo de Buey is the Spanish for “Ox’s eye” and it comes from the Mucuna Mutisiana plant, which is a climbing plant found in the Colombian regions of Antioquia, Cundinamarca, Magdalena, Norte de Santander and Santander. 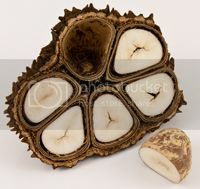 Its fruit is about 10 to 15cms long and it contains 2 or 3 brown seeds with a black band around them. The case of the fruit is used a medicine against oedema, the roots for the treatment of cholera and its leaves also have medicinal purposes. The coconut palm trees can be found in tropical sandy beaches of the Caribbean Sea, Indian Ocean and Pacific and if harvested, it can be found in other hot places. The palm tree can grow up to 30m in height and the leaves of can reach 3m in length and its fruit, the coconut, contains the biggest seed found. Coconut has been used since ancient times and is used in many ways: from the flesh of the fruit oil can be extracted for soaps and spreads, the wood is used for construction. 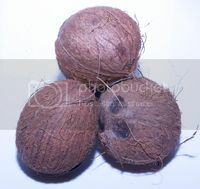 The fibres that surround the coconut can be used for brushes, mattresses and rope. In many places the unripe fruit is opened with a machete to extract its water which a refreshing drink. The shell is polished and used in many crafts. The Panama, camoruco (Sterculia apetala) is a tree of great size which originates from Central America and northen South America, it has a straight trunk and it branches out to great heights. It is widely distributed from Mexico to Venezuela and Colombia including some of the Antilles. In Venezuela is found at low sea levels, especially in the estates of Aragua and Carabobo where it reaches gigantic heights. During the growth period, it requires shade for its development. It’s a demanding tree where soil type is concerned, its roots are deep and has a long life. The trunk is straight and it develops quickly specially when is of great size, buttress need it for its own support because of its size. It can reach a height of 50m.